On-Call Firefighters provide emergency cover to over 90 per cent of the UK. There are over 14,000 On-Call Firefighters in England and they are responsible for operating 60 per cent of all fire engines and just like full-time Firefighters, are trained to deal with everything from extinguishing burning buildings to providing first aid. Most On-Call Firefighters are based in rural areas and will crew a designated appliance at an On-Call fire station. However, some are based in urban areas on stations alongside Wholetime crews (full-time firefighters). Some On-Call Firefighters also crew special appliances such as hydraulic platforms and water carriers. On-Call fire crews will be called upon to attend the full range of incidents including fires, floods, road traffic collisions, chemical spills and more, and work alongside their Wholetime colleagues at many incidents. There are various ways in which availability can be provided, this will primarily be to your local fire station for an immediate response but could include providing agreed cover at an alternative location on a delayed response. 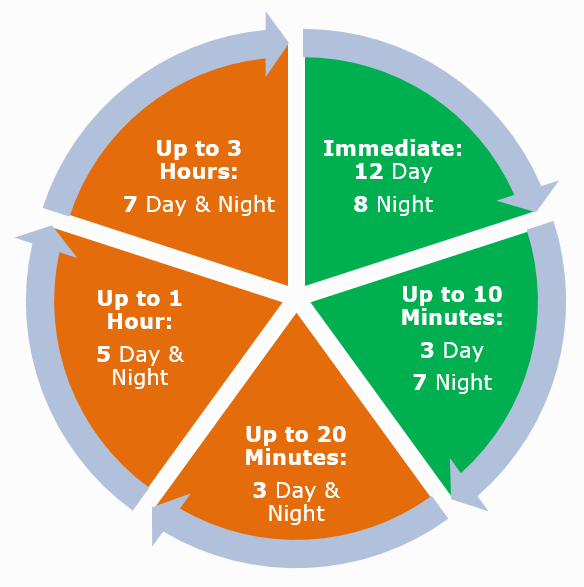 Cover given can be flexible and could be given during the day while at work or through the night and during the weekends while at home. There will be a requirement for you to provide a guaranteed level of availability which will be discussed during your application process. When providing availability for emergencies, an On-Call Firefighter will be required to have the ability to be alerted (normally via a smart phone app) and remain within an agreed area for a rapid or delayed response. An On-Call firefighter will also need their primary employers consent to be released for emergencies. The Response Model provides the Organisation with the capacity to respond to Emergency incidents of varying types and durations. This is achieved by having 15 fire appliance available to respond to emergency incidents from a fire station within 10 minutes. To provide further resilience to support the Response Model there are further fire appliances available which could be utilised anywhere from 20 minutes, 60 minutes or up to three hours. This resilient approach ensures we maintain the 15 front line appliances available where possible while ensuring we have reserve resources for dealing with periods of high demand. As an On-Call Firefighter with Buckinghamshire Fire and Rescue Service, you will be providing a range of cover to suit you and the requirements of the Organisation. With this and a number of other opportunities to had, the role of an On-Call Firefighter with BFRS has never been so rewarding. You will need to be committed to train and gain the skills needed for the role. For much of the time, an On-Call fire station is not crewed. Each On-Call Firefighter is alerted (normally via an app on their smart phone) which is activated when they are needed and they have a maximum amount of time to report to the required fire station and mobilise the necessary appliance(s). On-Call Firefighters will have other occupations, but when the call comes they drop whatever they are doing and become part of a team. Depending on the type of cover given, an On-Call Firefighter may respond from home and/or a place of work, day and/or night. Our On-Call Firefighters can respond to their nearest fire station or to an alternative location for a delayed response to larger or prolonged incidents. On-Call Firefighters are required to attend regular training activities. In addition to some weekend and other time periods to fulfill training for their role. There will also be opportunities to carry out additional duties such as, shifts with Wholetime colleagues, community fire safety, equipment maintenance and testing and general station routines. These duties are in addition to responding to emergencies for which you will receive a disturbance fee and additional hourly rate payments. During periods of On-Call cover you receive a retaining fee. It can be unpredictable, exciting and rewarding coupled with the satisfaction and respect that comes with providing a crucial service to the local community. You will learn new skills along the way such as first aid, road traffic collision procedures and fire safety, and there is an opportunity for you to learn other skills, such as Large Goods Vehicle (LGV) Driver. As an On-Call Firefighter you will receive remuneration for your availability, plus hourly rates (paid when you attend incidents or training activities) and disturbance fees (paid when attending incidents). Underpinning everything we do is a set of values to which we aspire in all our dealings whether they are with the public, partner agencies or our own staff. 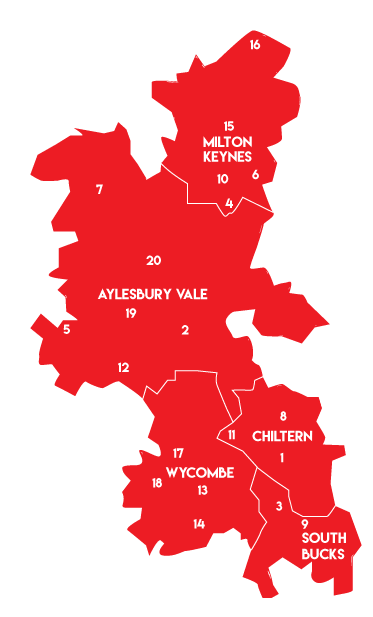 Our vision is to make Buckinghamshire and Milton Keynes the safest areas in England in which to live, work and travel. There are 20 strategically placed stations across Buckinghamshire and Milton Keynes. These include 10 stand-alone On-Call stations, eight combined Wholetime/On-Call stations and two Wholetime stations. Basics in fire ground safety, ladders, hoses and water delivery. Successfully passing this allows the recruit to attend emergency calls as a Trainee Firefighter. Trainees will learn about fire service hydraulics and how to operate fire service pumps in a range of scenarios and environments. Trainees will learn how to work safely at height, how to operate height safety equipment and perform rescues from height safely. ‘RTC’ Trainees learn how to safely resolve these types of incidents and operate technical rescue equipment. ‘BA’ and compartment fire behaviour training – Trainees will learn about compartment fire behaviour, operating and wearing breathing apparatus, extinguishing fires and carrying out rescues from these types of incidents. With all initial training modules complete, the trainee can perform all the core firefighting tasks at an emergency. At this stage they begin the two-year development process to become a competent Firefighter. Within the two year development period, you may also have the opportunity to attend further training modules such as Immediate Emergency Care (IEC), Tactical Ventilation, Large Goods Vehicle (LGV) Driver, Emergency Appliance Driver and other specialist skills specific to your area of response. Competency in the role will be demonstrated through assignments, assessments and the completion of a firefighter development portfolio. Further training in specific areas and skills will be acquired throughout the career of a firefighter and competency maintained through continuous training. 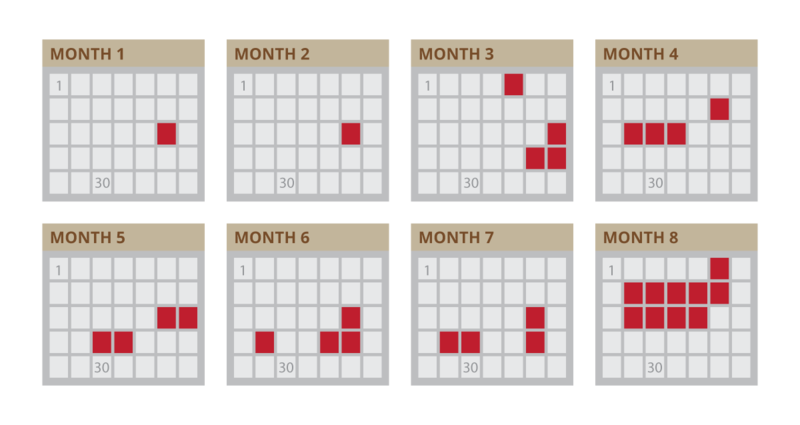 Below is an example calendar which shows the days of commitment to complete training. This is an ideal training period which shows availability for training centres and instructors to provide the module training. Green days are weekly drill sessions at your local fire station, red days are module training days, or testing days which cumulate into a two week residential breathing apparatus course. On-Call Firefighters receive a variety of payments for providing cover, training and responding to emergencies. As well as the current fees outlined below, we are also looking at alternative remuneration packages for a more flexible working arrangement. A retaining fee is paid for the hours of cover that are provided by the On-Call Firefighter and will vary depending on the amount of cover agreed. This is a set amount that is paid each time that an On-Call Firefighter responds to an emergency. Once alerted, an On-Call Firefighter is paid at a set hourly rate for the duration of the emergency call. They will also be paid at this rate for any training or additional work that they do for the Service. A newly recruited firefighter will commence on the trainee rate of pay until they have completed all the acquisition training modules. They then progress to the development rate of pay until their portfolio is completed, usually after two years. At this point they will graduate to the competent rate of pay. All members of the Fire and Rescue Service start their career gaining the essential front-line experience and training needed to become a competent firefighter. 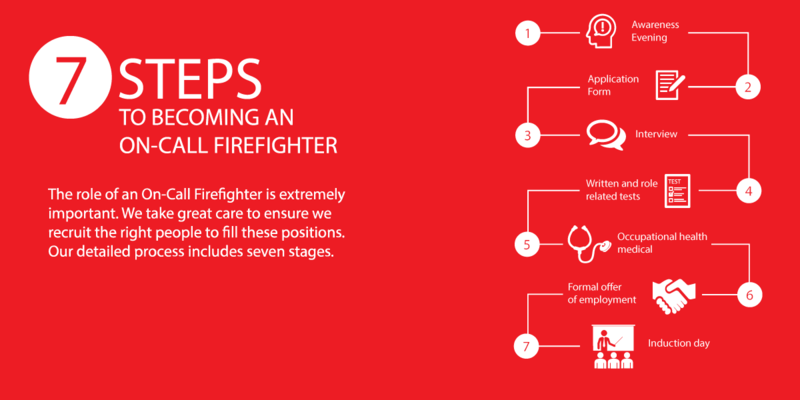 For those On-Call Firefighters seeking promotion, there are opportunities available to progress and develop. Save 34% on your train travel and 50% on Bus journeys throughout Buckinghamshire with a travel choices card. The Employee Assistant Programme offers 24/7, confidential support including counselling, guidance and referrals on any work, personal, financial, legal or family issues. Application form: You will be given a link after the awareness session to on an online application form. Interview: If your application is successful you will be invited to interview. Written and role based tests: Written testing using SHL, and role based physical testing. Occupational health medical: This assessment determines if you are medically fit to perform the role. Formal offer of employment: If you pass all the above you may be offered employment. Induction day: You will come to a station to start your On-Call journey! Learn more about role related testing! Being a part of On-Call fire crew elevates serving the community to an entirely new level. It is a challenging role which will suit people who can work under pressure. I first joined the Fire Service to give something back to the town which became home for me and my family. The role of an On-Call Firefighter became a very important part of my life. Therefore, when few years later I had an opportunity to take part in a full time crewing pilot, I accepted it straight away. Subsequently, I was offered a position as a Flexi Firefighter which is now my full time job alongside my On-Call duties. I work with Whole Time crews every day, responding to emergencies and taking an active part in prevention activities across the whole of Buckinghamshire. There are many opportunities for personal and career development available to On-Call firefighters. I completed number of courses designed to improve existing and gain new skills, which I find useful in everyday day life as well as on the job. I would recommend becoming an On-Call firefighter whether you want to respond during your hours of availability or progress to the full time operational position. The rewards of being a Firefighter are invaluable. The public rely on your help and it is a great privilege to be in the position of the help provider. I joined Buckinghamshire Fire and Rescue Service 11 years ago as an On Call Firefighter. From a young age, I always had aspirations to join the Fire Service and so, at 19 years old, I saw this as an excellent opportunity for me to begin and develop my career with the Fire Service. From 2007, whilst working as an On Call Firefighter, I also had a full time job working, originally, as an electrical engineer before working my way up to become District Technical Manager for a global gas and electric company. Not only did becoming an On Call Firefighter allow me to serve in my local community, I also felt a sense of escapism from my day to day job and the role allowed me to do something I have a real passion for. Seven years into my career as an On Call Firefighter, I applied for promotion and successfully became a Crew Commander. I believe my knowledge and experience gained whilst working in the utilities industry helped develop my managerial skills and experience further. This promotion has allowed me to take on increased responsibly in the Fire Service and I now regularly ride in charge of a fire appliance and run incidents. In 2017 I applied to become a full time Flexi Firefighter; a relatively new position created within Buckinghamshire Fire and Rescue Service. This meant leaving my full time ‘day job’ within the utilities industry. Whilst this was a big decision for me having been working within the gas and electric industry for 10 years, it simply was an opportunity I couldn’t turn down. For the last 12 months I have been working as a flexi Firefighter and haven’t looked back. This role has allowed me to meet lots of people and work at a variety of stations. I have also been lucky enough to have been trained as a SWRT (swift water rescue technician); a specialist skill which could save many lives. My focus now is to continue to improve upon the skills I have learnt and developed over the last decade and work towards promotion in this flexi role. Use the availability search bar below to enter your post code and find the closest On-Call Fire Station to you. Is there a Fire Station in your community? The results will tell you which is the closest station and what the drive time in normal road speed conditions is. The form will also tell you what additional stations and response times you can manage from your entered post code. Once you have established how long it will take you to respond to the station, please discuss this with your Station Commander for approval providing it sits within the required 10 minute response time. Find out if your Post Code is within our catchment! Use the form below to check your availability. Check your postcode to see your availability. Enter it into the search field and press enter. Are you ready to join Buckinghamshire Fire & Rescue Service and make a difference in your community? Register for an awareness session, this is mandatory before the applicaiton phase.